I don't get it. Didn't the citizens vote FOR Brexit? If the vote passed but the politicians don't honor the decision made by the people, then why bother having voted in the first place? This is such a mess, it's actually embarrassing. The EU has said it won't negotiate any further with regards to a deal, so the UK parliament speaker was right in snubbing May's desperate attempt to get an already terrible deal through at any cost. Another referendum with a much clearer picture of workable / actionable outcomes is the best way. Correct. You don't get it. Your first sentence. I disagree with, as the politicians just don't want us to leave the EU. You can't get clearer than leave or remain. That was on the first ballot paper plus with David Cameron telling everyone, what leave actually was. Leaving the CU, SM, ECJ. No doubt those posters will try and defend it and pretend it didn't happen but the are lying to themselves and everyone else. I agree with the second statement but would really show democracy isn't being upheld. it would be EU democracy, vote until we get the right answer. They were also told that a new trade agreement with the EU would be one of the easiest things in the world to negotiate. 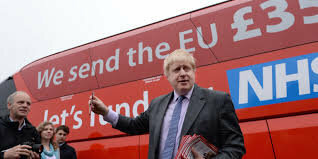 The one big lie is the Hard Brexiteer one that the referendum result = no-deal and nothing else. 1. Remainers keep telling us that referendums are only advisory. 2. The government will only implement the decision of a referendum if the result is remain. 3. Only the losers want a referendum. 4. Should there be another referendum and leave wins again, do you think anybody in their right mind would trust our self serving politicians to implement it. So you see Your Honour, all another referendum would do is rub salt into the already festering sores of democracy. I rest my case. We could make up a similar bogus list for 5-10.
yes, a landslide overwhelmingly dream-majority of 51,88 %, thanks to Boris the Liar Johnson c.s, while only a mare 48,11% voted for "remain", and 27,6 % were too stupid and too lazy to vote. But.. the British forget.. you need two for tango, so.. also the EU. For me.. we NEVER had to allow the UK to join in, why we did not follow Charles de Gaulle... so...throw the British out.. 29 March 23:00 GMT. Happily... 350 million pounds per week for the NHS... so.. you all are extremely happy.